In the summer of 2011, Daniel Hawley came through ALERT with Unit 46. 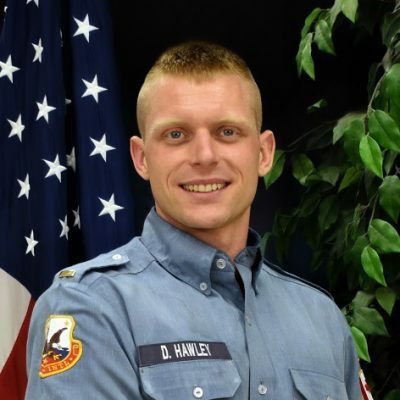 While in the Battalion, he trained in the areas of Emergency Medicine – EMT, and Emergency Services Operations. Following that, he worked in leadership as Basic Training Cadre and also with the Battalion as a part time instructor until he moved into a fulltime staff position working as logistics for the Operations Departments. In the spring of 2016 Daniel returned to the realm of Basic Training in the roll of Senior Drill Sergeant for Unit 55 and 56 and then accepted the position of Sergeant Major from January of 2017 to August 2018. When Daniel was young his parents were missionaries which led to him spending the early part of his childhood living in Haiti. After his family moved back from the mission field, he spent the rest of his childhood growing up on a small farm in Ontario, Canada.